It’s the toughest question to answer in urban development, and the Urban Land Institute, a Washington DC real estate development educational nonprofit, brought together a group of practitioners who have invested in solutions, summarized in Urban Land Magazine. – Mixed-income housing is unanimously the best approach to providing attainable housing. The most reliable rent-payers in some developments?… those in the lowest income categories vs. market-rate residents. For those who are familiar with the Grameen Bank that lends to the poorest businesses in the world, the unheard of 98% repayment rate also exceeds market rate in this country. People take an immense pride when given the opportunity to raise their economic standing and quality of life. – Nontraditional backgrounds (minorities, women) in development are bringing a new sensibility to providing better housing that more people can afford. By the way, the Grameen Bank previously mentioned lends solely to minorities, 94% of which are women. The point is, there’s a vastly underserved market that is now being catered to thanks to increasing diversity in business leadership. – Whatever housing is built, it must look good. This is the most fundamental rule for housing that is affordable, and one that is often broken. Developers probably experience payment defaults more often when that happens. 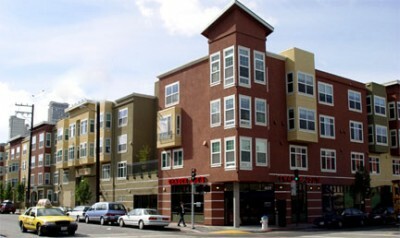 Image: North Beach Place, San Francisco. Note that Trader Joe’s is widely known as an affordable (and socially-conscious) grocery. An excellent supermarket alternative is the co-op.